The FPMA-MOBILE1800 is a mobile workstation for a desktop PC, LCD monitor, keyboard and mouse. The FPMA-MOBILE1800 allows you to maximize the efficiency and productivity of your work area. This product allows you to take your work area with you to any place you need. This cart offers space to a keyboard, mouse, PC and LCD screen. The LCD screen can be adjusted in five different ways to increase the use of the screen and prevent RSI. 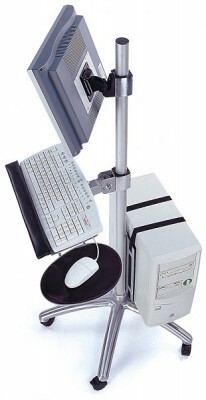 The LCD arm allow you to swing, lift, tilt and turn you LCD panel for maximum efficiency and ergonomic comfort.